You have some time to spare this weekend? Or, you are looking for some family outing and fishing is in the menu? This might be just what you are looking for. If it's to be your day, you will go home RM1,000 richer, who knows. This Fishing Competition is organised by one of the water operators in the state and this is the second similar competition in 2 years. Click on my previous posting for the Location Map. Some of the fishes that would not be included in this competition. Please spare them! The followings are the rules and regulation of the competition in Bahasa Malaysia. Have fun reading! Yuran penyertaan sebanyak RM40.00 untuk joran pertama. Manakala untuk joran berikutnya sebanyak RM15.00 sebatang dan terhad kepada dua batang joran sahaja. IKAN BUNTAL, IKAN LANGUT LANGUT, SESIRAT, BELANGKAS dan BELACAK adalah tidak diambil kira di dalam pertandingan ini. 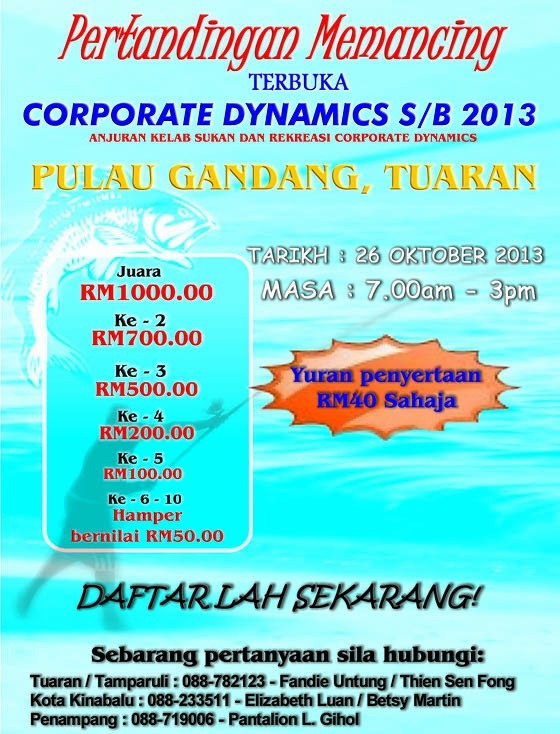 BEST OF LUCK TO ALL KAKI PANCING!